Nissan had launched the all-electric hatchback Nissan Leaf in Europe. The vehicle is launched in the United States in December. It is a five-seater hatchback rated with a driving range of 200km on a full charge. The vehicle does not show any tailpipe emissions. They can be considered as an alternative to the internal combustion engine cars. Hence it helps in following the government’s proposal of clean environment and using less oil. 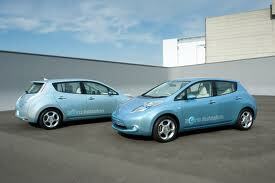 The price of the Nissan Leaf is found to be under 30,000 Euros after the incentives. The vehicle has a software that provides an indicator displayed at the top of the driver that helps in giving visual cues about the driving. Some of the panels provide information like the range that one could go at current driving conditions. It also provides the information as to how much power of the motor has been used in a particular moment. The Nissan Leaf has availability of an Eco mode. It helps in turning on a regenerative braking and optimizes the range. The test drives conducted reported that the maximum range of the Leaf was 134km (83 miles) to 151km (94 miles) when it was flipped on. In spite of the pretty average outward size, the car is considered as a large car in Japan, a medium car in Europe and a small car in the United States. However, the Nissan Leaf is extremely spacious. A plenty of leg and elbow room is provided along with comfortable seats. The boot of the vehicle can fill 330 liters. The bulbous shape of the over sized headlights has some important function that deals with the acoustics aerodynamics. The vehicle can be fully charged within eight hours and any household power outlets can be used for charging.